A sensitive and lyrical painter, Bess Harris took art lessons from Frederick Varley and was strongly influenced by Lawren Harris, with whom she developed a close friendship as early as 1918. She shared his interest in Eastern religions and matters of the soul, and in the world of art, modernism and abstraction. Bess was invited to show with the Group of Seven in the 1920s, and she was represented in the 1926 Wembley show in England and at the Corcoran Gallery of Art in Washington, DC, in 1930. In 1934, upon discovery of her husband Fred Housser's affair with artist Yvonne McKague, she divorced Fred and married Harris. Theirs was an important meeting of minds and souls that was anchored in creativity, and wherever they went, first to the United States to Hanover and Santa Fe, followed by their return to Canada to Vancouver, they quickly found themselves at the centre of the arts communities in these places. Bess continued to paint throughout her life, and her accomplishment is unmistakable in Day's End. This emotive work from the late 1920s exemplifies her sense of social consciousness, another commonality that drew her and Harris together. 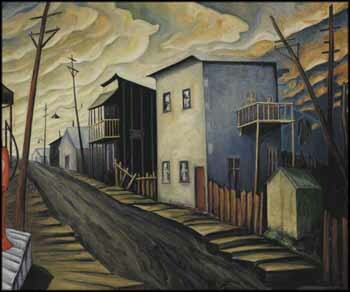 It might be a scene from St. John's Ward, an impoverished area in Toronto where Harris had also painted. Her fine sense of cool colour, the upwards movement in the painting and the angular geometry of the composition result in a compelling work that draws us into the scene. There is a solidity to form in Day's End that makes a resounding impression - in the boardwalk with the raw, earthy street between, the well-defined volume of the buildings and the carved cloud-forms above. Finally, it is the light that gives Day's End even more impact - raking across the scene and lighting up the buildings and boardwalk, and ultimately leading us into brightness and a subtle sense of transcendence at the end of the road.